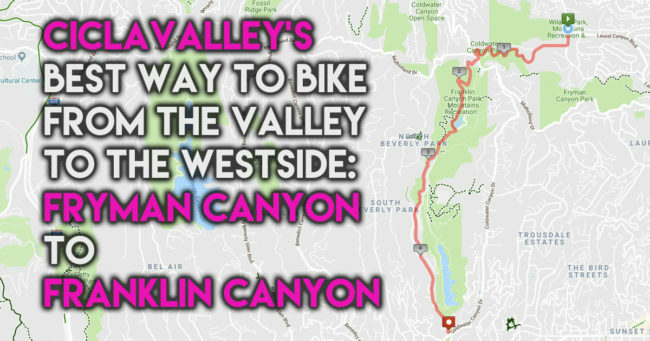 There’s a number of ways to get from the Valley to the Westside, but ultimately it should be the one that’s most comfortable to you. It’s a big stretch of mountain to get over, so sometimes you have to pick a route that’s not too far out of the way. Ultimately though, everyone who makes that choice has their own feel for how comfortable they are riding in certain types of traffic versus how much of a climb you want to bite off. If you’re coming from east of the 405 freeway, biking through Fryman Canyon is one of the best options around. It’s so good, there are actually two ways of getting up it. That’s because combined with some action on the side streets, the path in the park makes a loop which I exit halfway near Tree People to make it out onto Mulholland. Both routes have a short, punchy steep climb to start, but fortunately they are on pavement. The north side has about twice us much dirt before reaching the bailout point, but has a bit of a downhill that can be a little complicated if there are big crowds. Most hikers actually make a loop out of although that requires a little walking including walking by the fake Kardashian house used for exterior shots. One note before I proceed is that this park is super popular with hikers, so please be respectful of other people’s space. I only ride up Fryman Canyon to Coldwater Canyon instead of vice versa because you have to be aware of high volumes of walkers and their pets going downhill. Plus, I hate wearing my brakes out. For that reason, I normally chose the southernly route off of Iredell. It’s less than a half mile of dirt once you hit the path and if you only have a road bike with narrow tires, you’ll probably be fine. It doesn’t take long from the start to rise above the million dollar homes and be surrounded by nature. The half mile climb is really done before you know it and before making your way out to Mulholland, you have a couple of options. You can take the short, narrow path up to Tree People which requires some slight bike handling skills, but you’re rewarded with a water fountain and a traffic signal to continue your journey. For me, I choose most of the time to go a little further and take the wood chip laden path that spits out onto Mulholland. Obviously, the more dirt you get, the more fun you’ll have and merging onto the street there isn’t problematic since traffic is backed up most of the time. At this point, you’re at the second lowest point west of Cahuenga to get over the Santa Monicas, but it’s a lot safer option than the slightly beneath Sepulveda Pass. From here, your reward is taking the predominantly tranquil Franklin Canyon down. Sure, some drivers may take this route as a cut-through, but with it’s many twists and turns and slow turnover of the traffic signal at the entrance, it’s really not a great way to take your car. By bike though, it’s a lush oasis that even most locals are unfamiliar with. I’ve covered this park many times before, but you can also add a couple of dirt options if that’s your fancy making it through. It amazes me that I can make it from North Hollywood High to the Beverly Hills Hotel in a half hour using this route. You might be asking, that’s nice for coming from the Valley, but how do you get back? Coming back over Franklin Canyon is the obvious choice, although climbing it is a bit punchier coming up it’s Fryman counterpart. The initial climb into the park will get most out of the saddle, but save a short little kicker in the middle, it’s a joyous ride most of the way. For most, the issue is getting down once you reach Mulholland as I still adhere to the no downhill the No Downhill Through Fryman rule (or at least do it slowly). I’m perfectly content on riding with traffic on Cold water Canyon for one reason: you can ride faster than cars. There’s a lot of switchbacks at the top which are perfectly suited to bikes, do much so that my first venture down I quickly became over-confident and going over a guardrail for having too much speed. The biggest red flag you face is the road’s condition as you near the bottom, so make sure you take the lane to leave yourself space to adjust. Making your way from the top to Ventura Blvd. is easy to do in under five minutes. The other pro tip is Coldwater Canyon is also a great choice to go up during the morning commute. Traffic is so backed up, that no matter how slow you climb, you’re still going to be passing cars meaning you can avoid any unwanted movement like a sloth attack.